After graduating from university, Yan Hui Wang worked at a major patent office in China for six and a half years. She was responsible for all patent operations in the field of chemistry pertaining to Japan and China. Ms. Wang then gained employment with a Japanese patent office for two years. 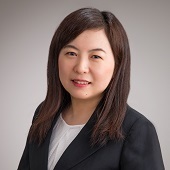 She joined our office after qualifying as a Chinese patent attorney in 2011 and as a Chinese lawyer in 2013. Atsushi YOSHIOKA Yoshiko KAMETANI, Ph.D.